Follow the White Bunny: Simply Shading Online Embroidery Workshop! 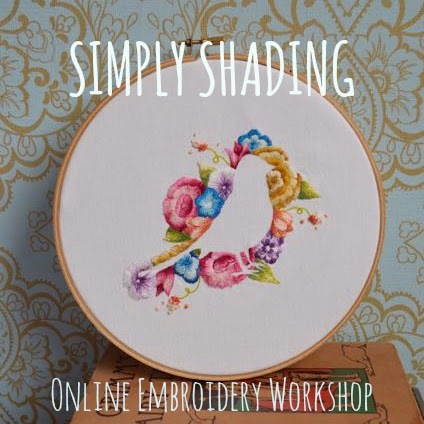 Simply Shading Online Embroidery Workshop! Often when I post a (progress) photo of one of my embroideries online I get comments like 'I wish I could embroider like that'. That inspired me to start writing and preparing my new workshop Simply Shading. It's aimed at embroiderers (I think even adventurous new embroiderers could join) who want to try their hand at shading but need a little push in the right direction. :) You will learn how to choose colours and shades and use them effectively. The workshop starts on the 18th of June and will end 4 weeks later. A kit with fabric, needles, floss holders and the Flower & Bird iron-on pattern (finished embroidery pictured above) are included but thread is not included. The lessons will be available as downloadable PDFs and there will be a student and teacher only forum for feedback and questions. And... as my former Furry Nice students know I'm always happy to answer any questions you have via e-mail or on Instagram. Shading is really a lot of fun and not incredibly complicated but it takes time, practice and patience. I look forward to tell you all about it in the workshop! You can sign up for the workshop now and if you use the code EARLYBIRDY before the 3rd of April, you will receive a 10% discount. Yay! Hope to see you many of you in the workshop! signed up as soon as I got the email yesterday! can't wait! What an adorable picture, I love it!